In my experience a very low percentage of people bother to execute a will before their death and this low rate of estate planning is even more prevalent among people who die at a young age or unexpectedly. Because of this, people commonly ask, who inherits if no will in Illinois. This article will address how different types of property are distributed after death when someone dies without a will or other estate planning documents. First, it will cover property that is considered “non-probate property,” which passes outside the rules of descent. Then the rules of descent and distribution (called “intestate succession”) of probate property will be explained. 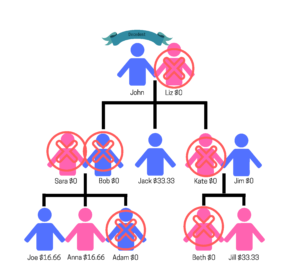 Finally, several examples of intestate succession with be illustrated. If you are an heir, executor, or administrator and think you might need an attorney, click this link to request a consultation. To understand who inherits when there is no will, it is necessary to understand what property will become part of the probate estate and what property will pass outside of the probate process. Only probate property follows the Illinois rules for descent and distribution. The easiest way to describe property of the probate estate is to discuss what is not probate property. Property owned by someone other than the person who died (he or she is called the “decedent”) is not part of the probate estate and does not pass to the decedent’s heirs. Illinois isn’t a community property state, so each spouse in a marriage owns property – even if acquired during the marriage. This can be a little tricky because most property isn’t formally titled, however, untitled property is usually of marginal value. Titled property, such as real estate, vehicles, bank accounts and financial instruments are generally owned by the titleholder. Property owned by someone other than the decedent, such as a spouse, is not part of the estate and does not pass at death. Property that is owned jointly with the right of survivorship or in tenancy by the entirety passes automatically to the other living owner(s) at the time of death. This property is not part of the probate estate and does not flow to the heirs through intestate succession. Jointly owned property is most commonly seen in real estate and bank accounts. Property with a named beneficiary also passes outside of probate irrespective of whether there is a will or not. However, there are two situations where property that normally passes to a named beneficiary becomes part of the probate estate. The first situation is where the decedent never bothered to fill in the blank for a beneficiary, this is much more common than one would expect. The other situation is where the named beneficiary died before the decedent; in that case the property also becomes part of the probate estate (so long as there are no successor beneficiaries named). Property that commonly has a named beneficiary includes investment accounts, retirement accounts and life insurance policies. Transfer on death accounts are similar to property with a named beneficiary. These accounts were specifically designed to avoid probate and transfer immediately to the person named at the time of the decedent’s death. Transfer on death accounts are most common at financial institutions and also are becoming more common in real estate ownership situations. The use of trusts are becoming more and more common. Typically, the person that is generally considered the “owner” of the property appoints themselves as trustee to hold the property in trust for themselves and then when a certain event occurs (usually death) the property flows to a successor trustee that holds the property for the benefit of themselves or others. Other types of trusts do exist, but are less common, especially among people of average wealth. In some trusts the trustee owns the property for the benefit of another right off the bat, these types of trusts are more common in wealthier families. Illinois also has land trusts, in which a trustee (usually Chicago Title and Trust Company) is the true legal owner and holds the real estate for the benefit of beneficiaries designated in the trust instrument. Bottom line, property held in trust as trustee is seldom part of a probate estate and the beneficial interest held by a beneficiary of a trust is not usually part of a probate estate either. Who Inherits the Probate Property If No Will in Illinois? Now that we know that non-probate property usually flows to joint owners and beneficiaries regardless of whether or not there is a will, let’s get to the bottom of the question at hand: who inherits probate property under Illinois law? The Illinois Probate Act is the law that sets forth the rules for inheriting property in Illinois. It generally follows the convention of most states when it comes to inheritance, but there are a few quirks, notably that a married person’s property does not go entirely to their spouse if they also have children. Generally, the property passes “per stirpes,” which means, that each branch of the family receives an equal share, so long as someone in that branch was living at the time of death. At the end of this article, I’ll provide some examples and charts to clarify this and other concepts. Below are the rules for inheritance that are commonly used. If the decedent had no descendants (children and grandchildren ect.) but has a spouse, the entire estate to the spouse. If there is a surviving spouse and descendants of the decedent then ½ to the spouse and ½ to the descendants per stirpes. If there is no surviving spouse, but descendants, the entire estate to the descendants per stirpes. If there is no spouse, no descendants, but a parent, brother, or sister or descendants of a brother or sister, the entire estate goes to the parents, brothers and sisters equally. However, if one parent is dead the surviving parent receives a double share an if there are descendants of a deceased brother or sister, they take per stirpes what the brother or sister would have received. 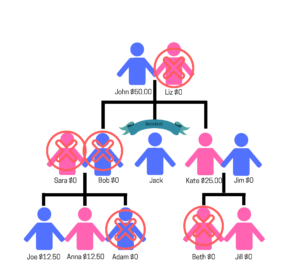 If there is no spouse, no descendants, no parents, no brothers, and no sisters, but a grandparent or descendant of a grandparent, ½ of the estate to the maternal grandparents or their descendants per stirpes if the grandparents are not alive and ½ to the paternal grandparents or their descendants per stirpes if the grandparents are not alive. The Illinois statute continues beyond this point, but it is extremely rare to have to rely on the grandparents and their lines as intestate successors. If you need to utilize more remote descent and distribution, reference 755 ILCS 5/2-1. Below are some examples along with charts that illustrate who inherits if no will in Illinois. 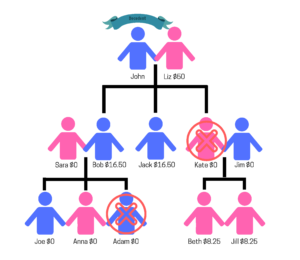 This chart illustrates a fairly common example of intestate succession. The decedent, John, dies leaving a spouse, several children and grandchildren. One child, Kate, died before John as well as one grandchild, Adam. John’s estate, nominally valued at $100.00 total, descends as illustrated above. John’s wife receives half the estate and the other half flows to his children. Since Kate predeceased John, her share is split equally among her children. Her spouse does not inherit from her father. This chart illustrates a scenario where the decedent’s spouse predeceased him leaving a child and grandchildren. John’s estate, nominally valued at $100.00 total, descends as illustrated above. Only one of John’s children is alive at the time of his death, Jack, and he receives 1/3. 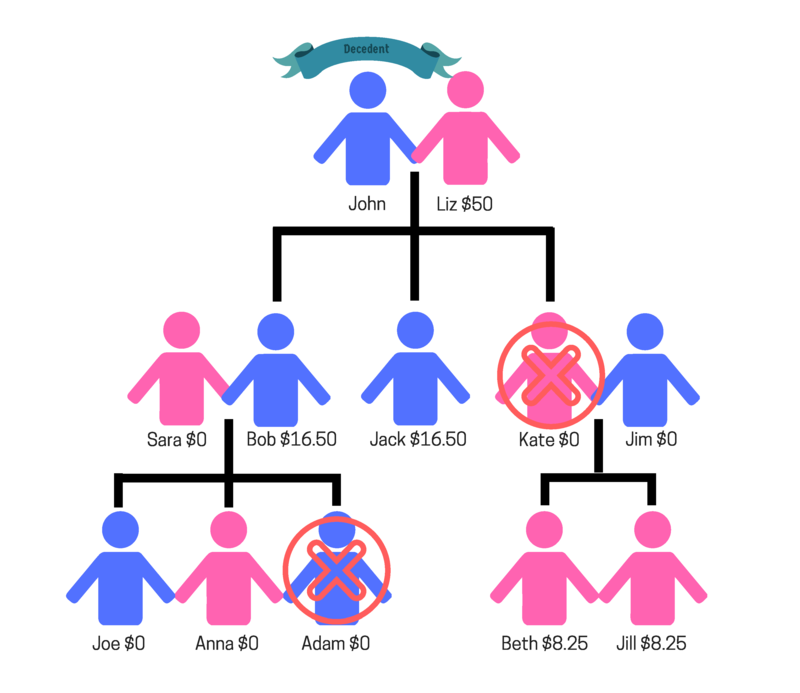 Bob and Kate’s children receive an equal portion of their parent’s share. The fact that Jim is still alive is immaterial as he does not inherit from his spouse’s father. 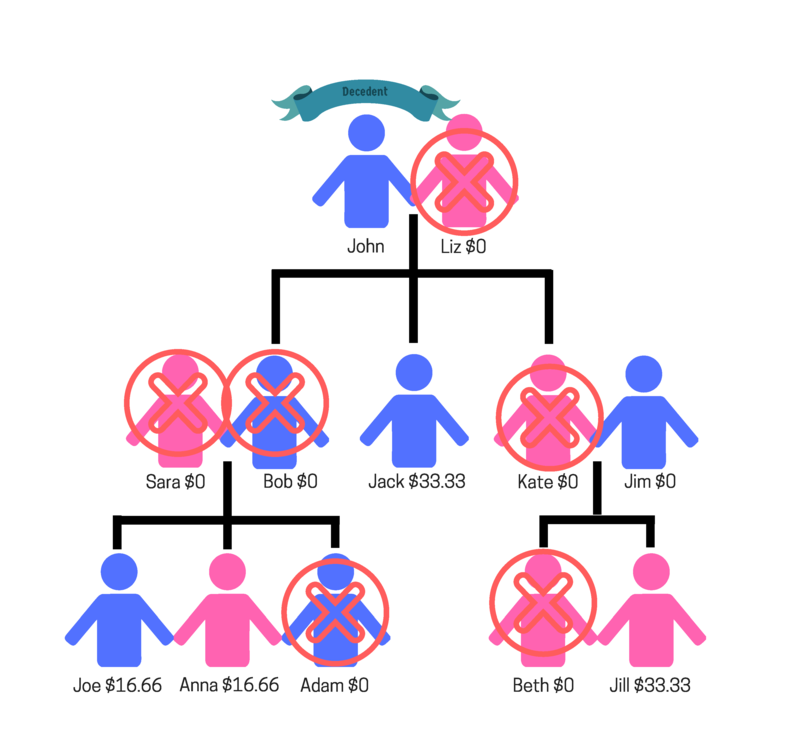 This chart illustrates a scenario where the decedent died leaving no direct descendants, but left one parent, a sibling and nieces and nephews. Jack’s estate, nominally valued at $100.00 total, descends as illustrated above. Jack’s parents and siblings normally receive an equal share, but because Jack’s mom predeceased him his father receives a double share. 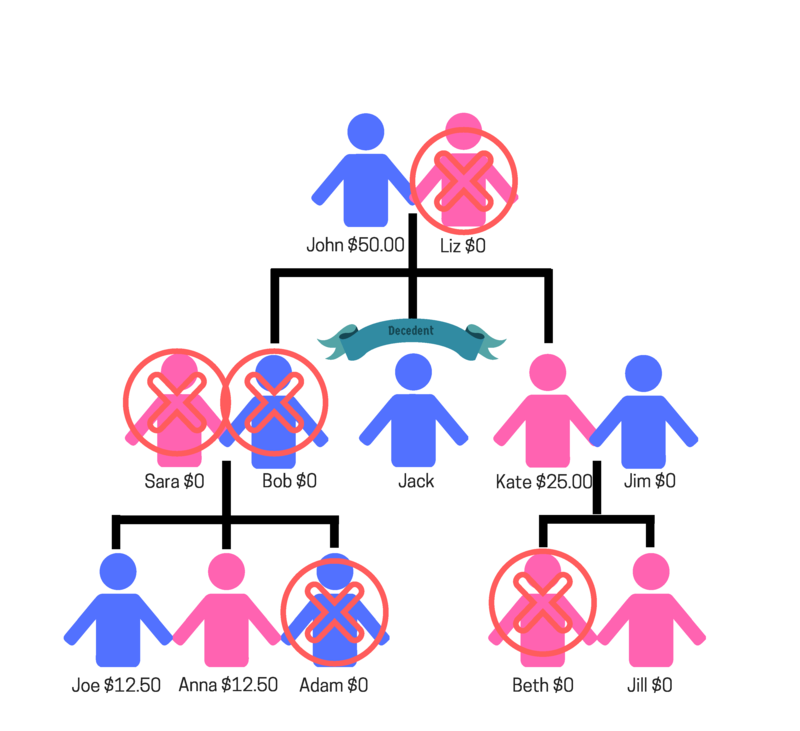 Since Bob predeceased Jack, Bob’s children split his share equally.